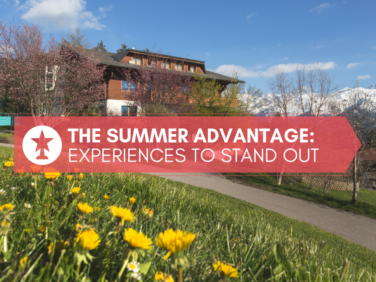 Alongside Aiglon’s belief in developing a balanced mind, body and spirit, universities are in search of academically qualified and personally balanced applicants. Although an application is evaluated mainly on academic credentials, the personal essay and list of activities often influence admission decisions. In order to develop an impressive non-academic side, a student must use their spare time effectively. How does a student spend their free time? When given an opportunity for free time or holiday breaks, a student’s choice of activity says a lot about their personality, aspirations and motivation. Does a student choose to read more books for pleasure? Does she teach herself computer programming code? Does he work in an office gaining professional experience in a job or internship? Does she attend an academic course in another country? Does he spend time doing community service projects? Does she continue her sports training? Does he shadow a technician in a lab or hospital? All of these are accepted by university admission officers as valid and impressive ways to spend free time. The important thing to remember is that the experience should be something that engages the student’s mind and teaches them something new or deepens their knowledge in a certain area. Real work experience helps applicants seeking admission to business management or hospitality programmes; lab or hospital work aid applicants interested in science or technological fields; academic courses allow an applicant to explore a passion in a certain area before committing to that subject at university. Some of the more impressive summer activities are those involving a student making a positive difference in the world around them. Aiglon alumni have spent their summers giving inspiration talks to disadvantaged youth in their town, assisting government officials with city planning logistics in a rural village in their country, and mentoring or tutoring younger students in their city; these are highly regarded experiences that come free of charge! Aiglon students have also paid to participate on extraordinary programmes in the US or UK where they learned the techniques for building an art portfolio at Parsons, the complexity of political science and economics at Columbia, the nuances in today’s social media and communication industry at UCLA, the details of design at UAL, and much more. There are also courses available to help students either prepare for the IB programme or receiving tutoring in specific IB subjects as their prepare for the final exams. It is important that students take time to rest, relax, and be with family at the end of the year. However, after a week or two, it is recommended that students find a meaningful experience that will not only help them realise their strengths and interests, but will also be impressive to mention in a university application. Most summer programmes require an application. Students are encouraged to search this comprehensive list of summer programmes around the world and find a few that seem interesting. It’s smart to apply to more than one programme in order to have options by the summertime. Some programmes are competitive and based on academic achievement (shown on a transcript and supported by a teacher recommendation letter), while others are not competitive and ask only for a participation fee. On occasion, partial scholarships may be available. The College and Career Counselling department is available to discuss the various options with students and help them to complete the applications.